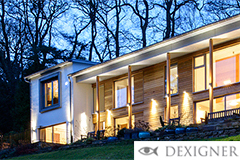 Since its launch in 2004, Designguide.com has received favorable reviews and compliments from industry peers and leaders, and currently is a top destination for the global design and building industry. 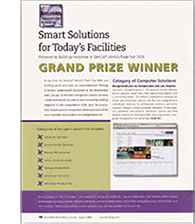 Awarded Grand Prize for Computer Solutions by Building Magazine at NeoCon Trade Show in Chicago. "You want it. Designguide has it. This premium Internet directory delivers powerful search tools amid sophisticated graphics and user-friendly design. The website is dedicated to providing the design and construction industry with the most comprehensive and efficient directory for professionals, products, and online resources. 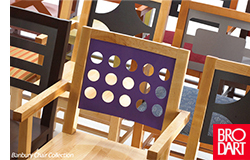 Browse a virtual worldwide showroom of new products, portfolios, and resources. Bookmark favorites and send batched requests for information. Users may research companies or products on the site for Free." "This award-winning online resource and forum for the building and design industries has just launched a new platform with compelling visuals and state-of-the-art features. The site hosts more than 10,000 professionals who showcase their design services and projects. It's also a terrific source to locate thousands of building product and furnishings manufacturers as well as numerous building codes." 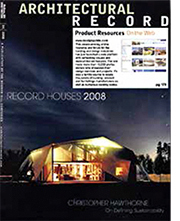 "Designguide offers an online showroom featuring top-of-the-line products and materials for commercial markets. From this site, users can research some of the industry's most impressive products, save company profiles and request information from organizations such as Brodart." "Designguide.com has quickly become the design + construction industry's most comprehensive and efficient directory for professionals, products and resources." 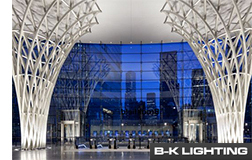 "B-K Lighting has successfully teamed with designguide.com to enhance the way design professionals locate information about its products and services industry." 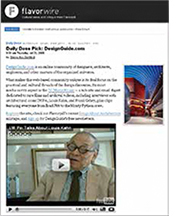 subsite and email digest dedicated to rare films and archival videos, including interviews with architectural icons IM Pei, Louis Kahn, and Frank Gehry, plus clips featuring everyone from Brad Pitt to the Monty Python crew." The Design Professional Directory features the top building design firms across the US and Canada, including Architects, Interior Designers, Engineers and Landscape Architects. Professionals firms are indexed by location and building specialization. The Building Products Guide showcases the top manufacturers of building products and furnishings for both the commercial and residential sectors. Products are organized and searchable through keyword searches, CSI Masterformat index, by product type index and by manufacturer name. The designguide Resource section offers 1000 links to important industry sites, including, processional associations, design centers, publishes and building codes.